If you want to write songs and play them in front of people, this is for you. Perfect size, weight and shape. Would have been happy to pay a little extra for some smaller detailed upgrades. Don’t you love that feeling when everything just clicks into place? Unwrapping the Auden Julia is exactly that - it feels right! A perfect fit, beautiful looks, ready to play straight out of the box - this could be love at first sight. Upon opening the dull bronze locks on the brown leather hardcase, which features cream-coloured string sewn in around the edges, this Julia almost blends into the dark fur lining. 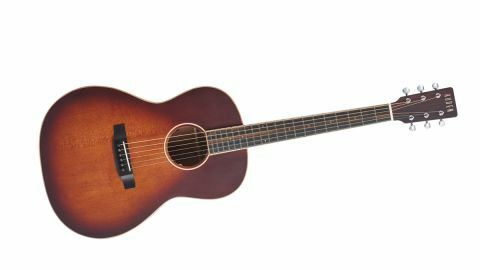 The subtle colour is described as Tobacco: barely noticeable in a darkened room but when the light bounces off the AAA cedar top, it looks like someone has lit a fire inside the guitar’s hollow body. The warm sunburst fades into satin black toward the neck, where the top feels like silk despite its limited lacquering. While we tend to prefer blondes, it’s hard to deny my inner bluesman’s attraction to the Auden. The Julia’s back and sides are made from African mahogany, bound together by maple lines. There’s also a neat maple circle around the soundhole. The same mahogany is used, presumably to keep costs down, on the neck, but it’s quite nice to know that the majority of the guitar could be from the same tree. The joint differs, made from dovetail and hide glue. The strings are kept in place by a beautiful ebony bridge, and the saddle is a mix, again perhaps to save cost, of bone and composite. It does the job well, to the point that strings felt secure during tightening and loosening. Along the 22-fret fingerboard is an ebony top that makes hitting the right notes easy. Without the guitar being a cutaway, notes beyond the 15th fret are more difficult to reach, but this guitar wasn’t made for solos. At the other end of the neck and headstock, the word Auden sits atop the guitar like a king looking down upon its glorious realm. The strings arch over a bone nut and around some beautifully chromed Schertler machine heads, which are neatly spaced enough that you don’t knock another one out of tune if you have to remove another by repetitively twisting its neighbour. Strapping the guitar, for those odd performers who like to stand up when they play, is easy. The lug on the bottom of the body doubles as a jack input should you want to use the Schertler Lydia preamp and play through an amplifier or sound system. You attach the other end of the strap to a lug that appears slightly on the underside of the neck joint. It really is well placed and fits quite superbly, which is more than you can say for a lot of acoustics that so often overlook this. Remember when we were talking about the perfect fit? This is why. We’ve been reviewing guitars for a while now, but we don’t think we’ve ever felt so at ease with one like we did so quickly with Auden’s Julia. At 1,000mm long, from head to base, every element of the guitar is reachable, from its head to jack input. For a singer-songwriter the neck width at nut of 43mm puts the space between top and bottom Es at 38mm, which is perfect for quick transition between chords. Yet, at the other end, the right hand is playing those same strings across a space of 52mm, meaning the chubby-handed fingerstylers don’t get in their own way. While sitting down, the guitar’s body fits perfectly. The waist of 231mm dips in at the perfect angle from the widest part of the 365mm belly, and eases out to the shoulders to create a beautiful little concert - it may be small, but, boy, does it sing. A firm strum of your favourite chord should produce a great balance of lows, mids and highs from the soundhole, but this goes one step further. We played several rhythm songs on the lower strings and found no problems palm muting as the notes played true. Even when put to the test on a more delicate tune like Yesterday by The Beatles, our fingers seemed to fall into the correct placement and plucking motion. The Julia is so easy to play, we’ve started looking at our personal collection of instruments and realised there’s a big gaping hole that could easily be filled by an Auden. When you consider the asking price for a guitar such as this, we’d be happy to pay more than £1,500. Sure, Auden may have cut a few corners, but it isn’t visible in the aesthetics, and my enjoyment while playing it is worth that cost alone. But don’t worry, you don’t have to fork out an excessive amount. This flawless guitar appears to boast a standard RRP of just £999. This is by no means an entry-level guitar, but for the good player who wants to take their songwriting to the next level, this is certainly an inspiring one and will get you playing old chords in new ways. It doesn’t break the bank and is light enough to be thrown over your shoulder for an extended setlist. For us, the light frame on Auden’s Julia, amounting to around 1.6kg, is a huge benefit. We sense that we’ll be seeing plenty of them at open mic nights around the country pretty soon.